Woollyhugs > Latest.. > Latest > Much earlier in 2019, tis the Christmas Stocking project! Having to go much earlier this year so that stockings can be taken over to Belarus when the children return home after their visit in the summer. They will still be given to the children around the time of the orthodox Christmas. So last posting is Friday 31st May 2019. Even if you took part last year, please do read the instructions, they are absolutely vital to making this work. We are grateful to you, this is a wonderful project. Thank you. 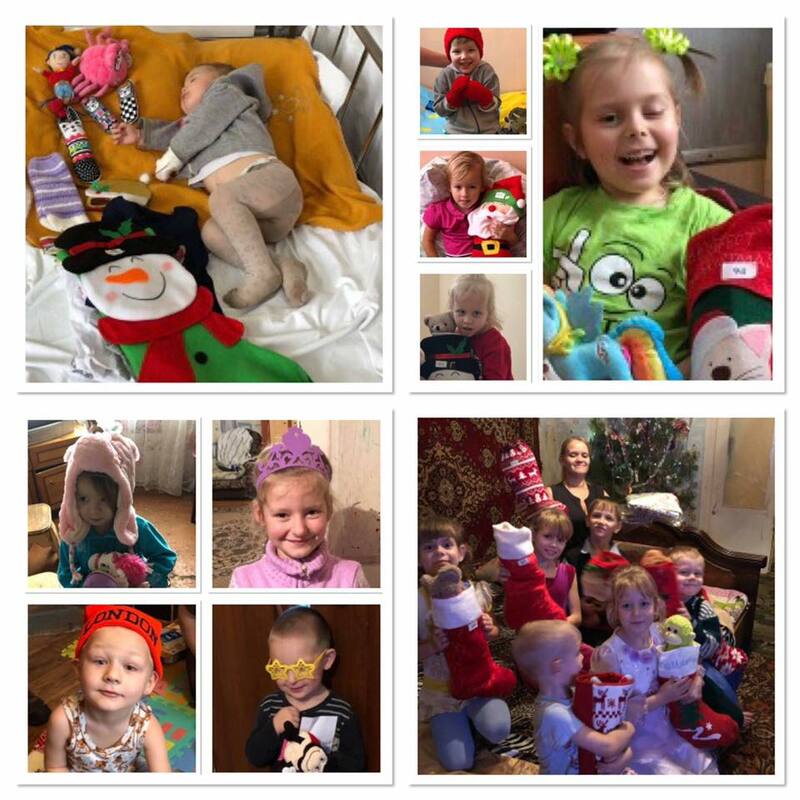 Elizabeth Parker (Mid Suffolk Chernobyl Children’s Life line link)and her team personally take filled stockings to Belarus, to very sick children in hospitals and also to the homes of very disadvantaged children. Their aim is to give the children a real Christmas present and those they give to have most likely never received a Christmas present before. It is very important to note this is absolutely not one of those shoe box appeals, so these stockings do not include functional toothpaste/brush type items, and there are no strings attached. It is just a wonderful thing to be able to do for some of the most disavanted and sick children. Would you like to help us?!! We are looking for home made ( knit, crochet or sewn) stockings, OR shop bought stockings, we found some on Ebay and Amazon but PLEASE as close to the size below as possible. These can be sent full, all guidance below, or empty for them to fill. We need both. You can also just contribute little gifts/sweets if you prefer. Whether it is home made or shop bought, stockings need to be as close to 18cm by 40cm (approx 7” x 16) which seems to be average standard size of shop bought ones. A list of suggested items is below but these are by no means the only items to be included, feel free to add anything you want! The gifts inside the stockings should not be wrapped in Christmas paper as this makes it easier if they are stopped at customs. They aim to take stockings for children from birth to 16 years . Most people want to give to young children so some for older teenagers would be appreciated, but whichever age range you go for they are very grateful. Aim for one of these… 0-2, 2-4, 4-6, 6-8. 8-10, 10-12, 12-14, 14-16, and decide boy or girl. VERY IMPORTANT – Completed stockings should weigh no more than 650 grams please and need to be able to lie as flat as possible for travelling purposes. Just decide your age group and make sure it all fits in the weight. Reiterating the 650g weight limit! Liquids may not be sent neither should toy guns, knives or other weapons etc be sent to boys as some parents might object to these. Hair slides, bobble, elastics etc for girls, colourful, sparkly items are really liked. Girls love all things pink and “blingy” ! them in the right place. Funny socks and slipper socks are liked very much, particularly if they are “Character “ones. We will have quite a bit of admin this end, so please send any filled stockings to us wrapped in a carrier bag with a list of the contents jotted down on a bit of paper and the weight in grammes We need to fill in a spreadsheet which helps with customs and this will mean we wont have to empty each one!